260. A differential movement. The screw, C, works in a nut secured to the hub of the wheel, E, the nut being free to turn in a bearing in the shorter standard, but prevented by the bearing from any lateral motion. 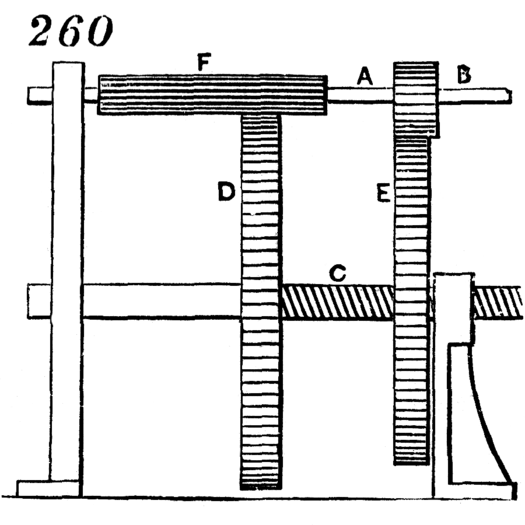 The screw-shaft is secured in the wheel, D. The driving-shaft, A, carries two pinions, F and B. If these pinions were of such size as to turn the two wheels, D and E, with an equal velocity, the screw would remain at rest; but the said wheels being driven at unequal velocities, the screw travels according to the difference of velocity.